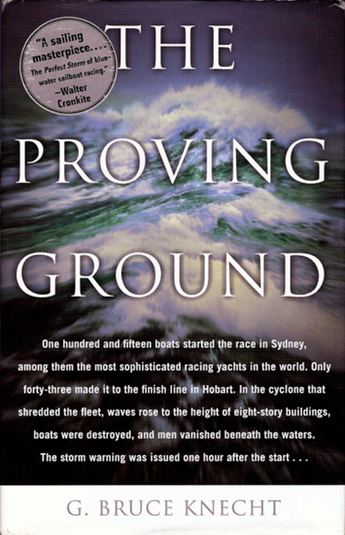 My Review: This book focuses on the annual 630 mile Sidney (Australia) to Hobart (New Zealand) race of 1998 in which 115 boats competed. 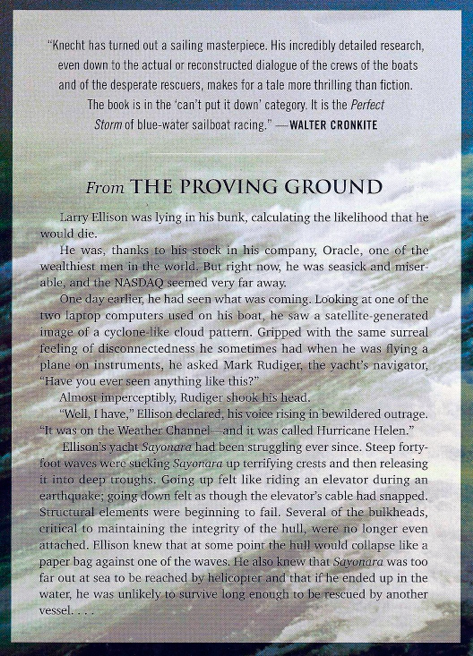 What made this race stand out and gave the book its name was the disastrous surprise cyclone (hurricane) that struck the racing fleet at a most vulnerable point. Of the 115, only 43 made it to the finish line. Some boats turned back, many were damaged, some were lost, as were several sailors. While the men described in The Proving Ground share the same need for extreme adventure with those in Between a Rock and a Hard Place and A Voyage for Madmen, theirs was not so much an individual test. It was if anything a contest between wealthy men who could bankroll the construction of specially designed racing machines and the crews to sail them. While often super-competitive and extremely successful entrepreneurs, they were just as often not as skilled at sailboat racing as the crew they hired. Another yacht, Sword of Orion, was owned and skippered by a wealthy pharmacist, Rob Kothe, who jumped into high stakes ocean racing with little experience, but a willingness to spend money. Kothe, known as “Kooky”, was poorly equipped to make decisions in the conditions that developed during this race and as a result lost a man overboard who could not be recovered. Richard Winning, another wealthy retired entrepreneur, skippered a third more traditional wooden yacht, Winston Churchill. The boat’s traditional full-keeled design initially did well in the worsening conditions. But finally the sometimes eighty food seas holed the Churchill and she went down.